Celebrating 84 delicious years of baked goods on the New Hampshire Seacoast! 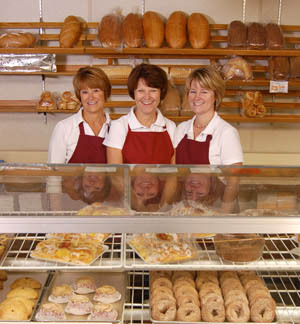 We are a friendly, family-owned and operated bakery celebrating our 84th year in business in downtown Dover, NH. We bake the best bread on the NH Seacoast, delicious cookies, pies, rolls, and pastries with pride. Our hand-crafted wedding cakes are beautifully traditional or elegantly modern and taste just as delicious as they look. Our restaurant serves up the finest hearty breakfast and lunch in the Tri-City area of Dover, Somersworth and Rochester. The freshly baked pies, cakes and our tempting desserts are a great way to end a perfect lunch too! Our friendly service is well known in the Seacoast area and people come from as far away as Boston to enjoy our award-winning Maple Squares. Have you tried our fresh breads, pastries and pork pies? Stop in and enjoy! Monday through Saturday 5:30am - 3:00pm.